So, you can see that Babe really was a fan in his own way – he was a fan of kids! And, there were many, many kids that Babe “adopted” in his own way – by being involved in their lives. Well, there was one little boy who really had an amazing experience with Babe and we’d like to share that story with you here. One day, Babe saw a man and his little boy playing catch in a park near Babe’s house in New York. He decided to walk over and watch the two play catch for awhile. Babe talked to the man for a little bit and found out that the little boy was only three years old. He was very impressed by how well the boy could play catch. Babe then got the idea to make the little boy, whose name was Ray Kelly, his personal mascot! So the next day, Babe picked up this little boy and took him to the stadium with him for his game. And, that’s how Little Ray Kelly became a part of the history of the game of baseball. 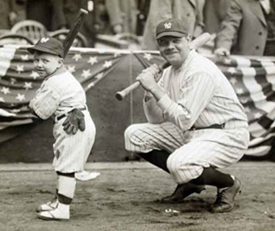 Little Ray Kelly was Babe’s personal mascot for ten years. He even had his own Yankee uniform. And, he was with the Babe all the time during Yankee home games. Can you imagine being a mascot for an athlete as special, talented and famous as Babe? What an honor it would be! Little Ray became Babe’s mascot when the Yankees were still playing in a stadium called “The Polo Grounds”. When Yankee Stadium, otherwise known as “The House That Ruth Built”, was opened in 1923, Babe had this picture taken with Little Ray Kelly. When Ray turned thirteen, he needed to start paying much more attention to his school work. Babe valued education very much and thought it was very important for kids to be in school. So Little Ray’s mascot days came to an end, although he would never forget his experiences with the Babe.